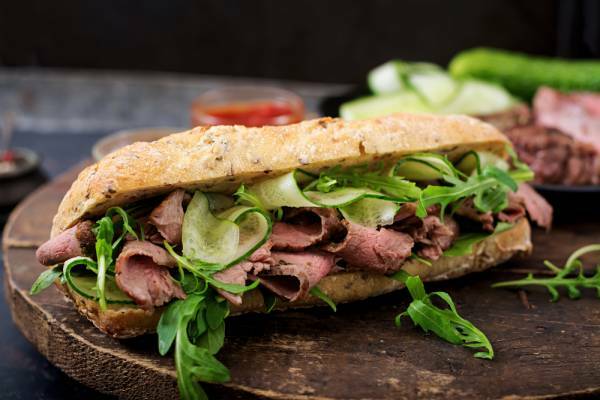 This isn't just any old sandwich....this tastes so good, we guarantee you will be cooking it again and again. Rump steak is a very popular cut and full of flavour and texture once you've learnt a few simple cooking steps. We will teach you to make a basic mayonnaise with a dash of truffle oil, a really simple process when you know how. Served with toasted ciabatta and rocket. Season the steak with salt and pepper, ensuring each side is seasoned evenly. Coat with sunflower oil. Heat the chargrill until slightly smoking . Place the steak onto the chargrill for three minutes. Turn and cook for another three minutes. Remove from the heat and allow to rest for six or seven minutes. Season again with a pinch of maldon salt. While the chargrill is still hot, slice the ciabatta in half and toast the bread.